Now DISCOUNTED FOR A LIMITED TIME from $97 to $9.99! You’ll learn where to get interval data, how to get it into a useful format (even with NEM12 data!) and how to identify and quantify energy savings opportunities. Did you know that most businesses and governments are missing out on the opportunity to, at little or no cost, reduce their energy use by between 5% to 10%. And importantly to also cut their carbon emissions from the use of energy by 5% to 10%. As a result a typical office firm, with say 100 staff, is each year unnecessarily spending around $4,000 and generating about 25 more tonnes of greenhouse gas – equivalent to the emissions of 6 cars. You see for the many businesses and governments energy management is something that is put in the “too hard” basket. About all they do is negotiate a good price for their electricity, gas and fuel. And whilst there are energy engineers like myself who have the expertise to help them cut their energy consumption, reduce costs and size down their carbon footprint it can take a lot of time and money to get results. Now if you can, I would really urge you to get hold of a good energy efficiency engineer and get them to help you reduce your energy usage. But if you’re time poor, don’t have the budget, and – lets be frank here – reducing your energy use isn’t the highest priority, the chances are that you can still do a few simple things without spending too much time or money to noticeably cut your energy costs and cut your corporate greenhouse gas emissions. And you don’t need an energy engineer to find these opportunities. But you do need… Interval data. 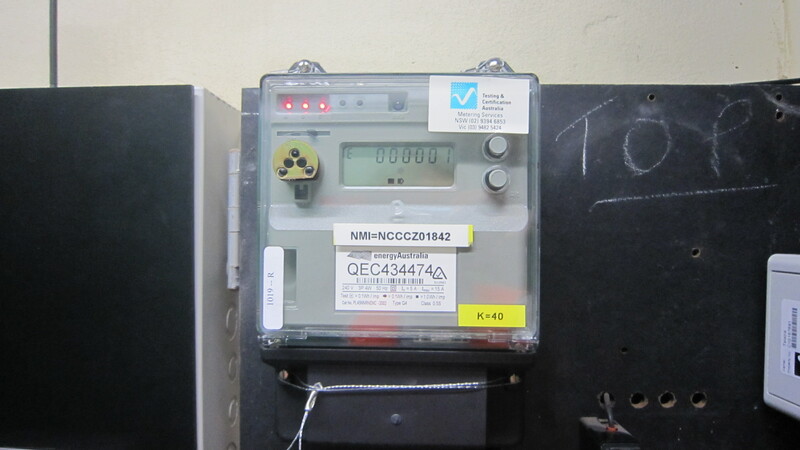 Interval data is electricity, and occasionally gas, consumption data at closely spaced intervals, typically at 15, 30 or 60 minute intervals, showing the amount of energy consumed in each interval. And it’s absolute gold when it comes to identifying where there may be easy opportunities to reduce energy consumption. Watch the video below to see just how powerful it can be! You may be able to get interval data for your site for free. But it will most likely be in a format that you can’t make sense of. It will be in a massive spreadsheet or other file type and there won’t be any graphs or any guidance on how to make sense of the data. If you are in Australia it will probably be in the very hard to use NEM12 format. Then, once you’ve made sense of it, it won’t give you any guidance on how to identify and quantify the energy saving opportunities. And you may not have many other options. You might be able to subscribe to a data portal, but these often come with a hefty subscription charge, and whilst they do provide a lot of graphs, they don’t generally provide you with enough information to actually figure out the dollars you might be able to save and if its worthwhile taking action. Or you could purchase a USD $595 spreadsheet that could help you graph the data – that seems like a pretty expensive spreadsheet to me! So this is why I am very pleased to be able to present to you this introductory training course on interval data analysis. This course shows you where you can get interval data from, how to manipulate it into a useful format (yes, even with NEM12 formatted data), how to match it to how your site is actually used, and how to identify and quantify energy savings opportunities, just like the ones you saw in the earlier examples. It builds on my experience in analyzing interval data for hundreds of buildings. I actually wish that had this training available back when I started, because it would have saved countless hours of trying to figure it how to work with awkward data files. The training covers the four main types of formats in which interval data is usually provided. Its focus is not on teaching you about interval data, but giving you the three key skills to do something with interval data. It is set out in such a way that only once you’ve mastered the first skill can you move onto the second skill, similarly only once you’ve mastered the second skill can you move onto the third skill, and then you are also tested on your knowledge of the third skill to ensure that you’ve really got it. This course isn’t just a webinar and quick demonstration, rather it systematically shows you what to do, and makes sure you know how to do it. And once you have completed the course and have the spreadsheet skills to work with interval data, you’ll have none of the constraints of a third party spreadsheet or online portal when it comes to analyzing your data. Interval data provides you with the fastest and easiest way to identify and quantify opportunities to cut your energy use. A small investment in learning how to use it will help you both save money for your organisation, and very importantly, cut your carbon footprint. Perhaps, like me, you want to make a contribution to reducing greenhouse gas emissions. Interval data is so useful when it comes to identifying opportunities to save energy and cut emissions, that should you not identify opportunities to save at least twice what this course cost you I’ll not only refund you, I’ll also analyze a data file you send me and highlight where I think the savings opportunities might be. I urge you to take this course, and look forward to teaching you. This course assumes an intermediate knowledge of Microsoft Excel, and an ability to determine electricity tariff’s from an electricity bill.